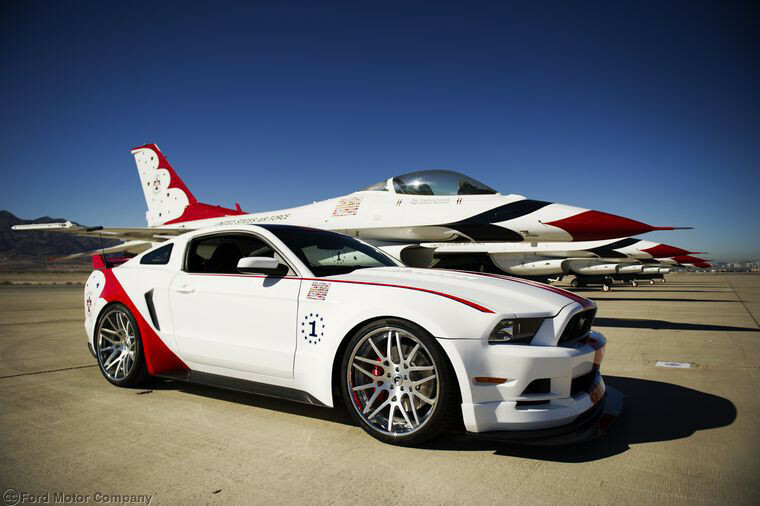 This 2014 Mustang “Thunderbird” is VIN number 0001 and is a one-of-a-kind Ford. From a collector’s standpoint, expect this colorful and rare Mustang to catch a pretty penny when it hits the auction blocks, both now and in the future. It also has a ton of performance mustang parts and go-fast goodies under the hood. You probably noticed the wide-body kit, 22 inch custom rims and the paint job, but this special edition 2014 Mustang GT also sports a Ford Racing supercharger, suspension handling pack and Brembo brakes. The EAA Young Eagles program provides free flight lessons to young people across the country who would be unable to afford lessons otherwise. The EAA has provided free introductory flights to over 1.6 million kids, dating its services back to 1992. Celebrating their 60th anniversary, the U.S. Air Force Thunderbirds air demonstration squadron perform the fastest flight show around in their easily identifiable red, white and blue F-16 Falcon fighter jets. This classic Thunderbird paint scheme has been replicated for these one-time production Mustangs. Previous Entry Get Ready – The 2013 AmericanMuscle Car Show is Almost Here! Next Entry Watch: Mustangs & The AM Calendar Girls Behind The Scenes Photo Shoot! I have a black 2014 Mustang..this has inspired me…I am going to build mine to resemble the B1 Lancer. I served for 20+ years in the United States Air Force. One of my many jobs was working with pilots of the B1 and I deployed in support of Operation Enduring/Iraqi Freedom assisting with B1 support. Thanks for the inspiration! That’s a very creative idea–it’s always a nice bonus to be able to add a personal touch like that to the build. Send us some photos when you’ve got everything finished. And thank you for your service!